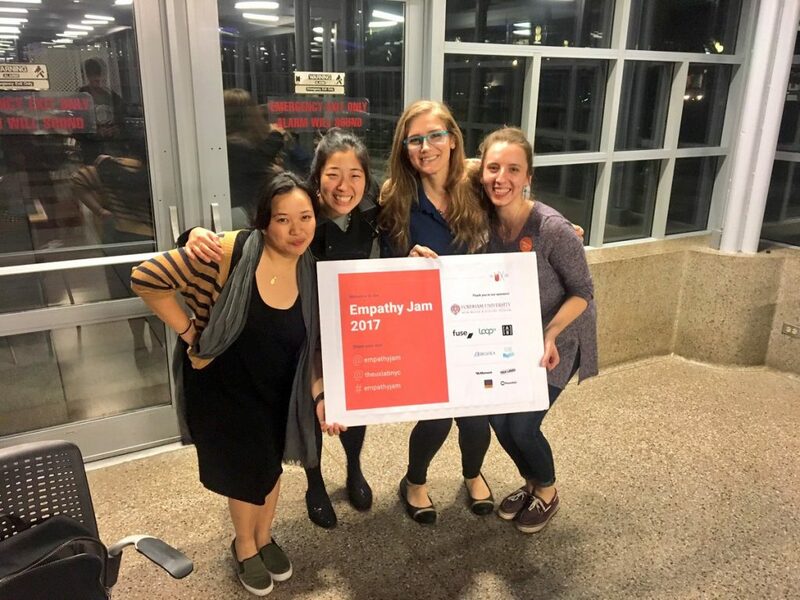 Last month on Saturday, October 28th, I co-hosted the 2nd annual Empathy Jam 2017 at Fordham University with Shannon, Ariella and Krizia. 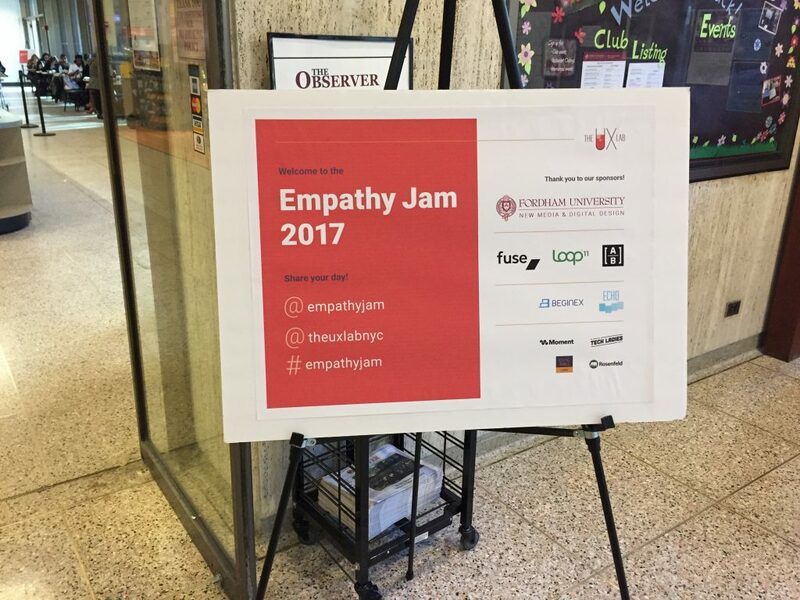 I attended the inaugural Empathy Jam last year and had a phenomenal experience. It was the first design competition I attended and a place where my passion for UX was ignited and validated. It was an amazing experience to get involved this year by planning it. Here’s what went behind bringing together brilliant people to work on a meaningful challenge. In general, I love design competitions (UX hackathons) for many reasons and appreciate people in the New York City tech scene who pour their efforts into hosting great events. I love how they provide a platform for designers like myself to validate their curiosity and work on solving problems with other passionate individuals without having to invest so much time and effort up front. I also love the networking aspect of it and meeting industry veterans who are willing to share their wisdom to a huge crowd of eager problem-solvers. I’ve met most of my closest UX friends (including my amazing co-organizers) at design competitions! They’re great and I always recommend people to participate in them, regardless of where they are in their careers. – I loved it last year! It has a special place in my heart since it was my first experience of doing real UX work and applying my knowledge to a practical challenge. It led to a lot of strong friendships and even helped me get published in UX Booth! 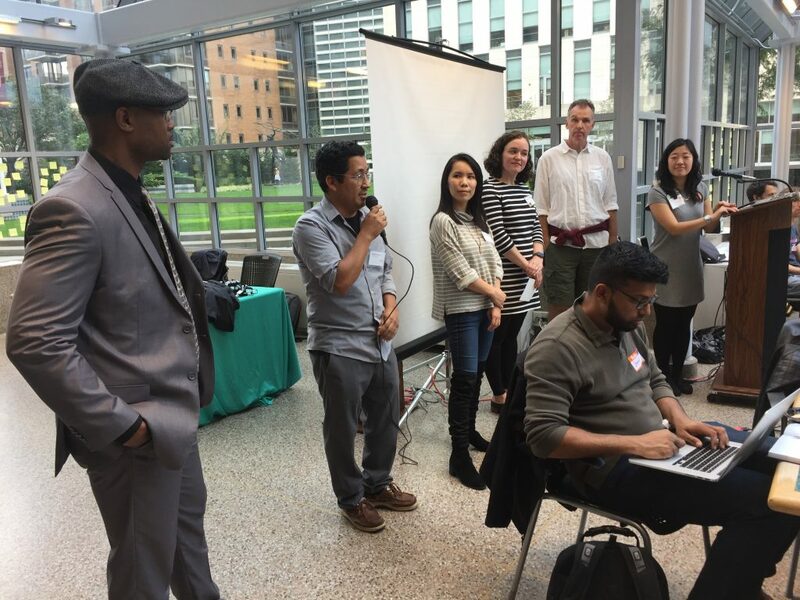 My article, “Why attend a UX hackathon?” was inspired by this event. – Shannon reached out to me. 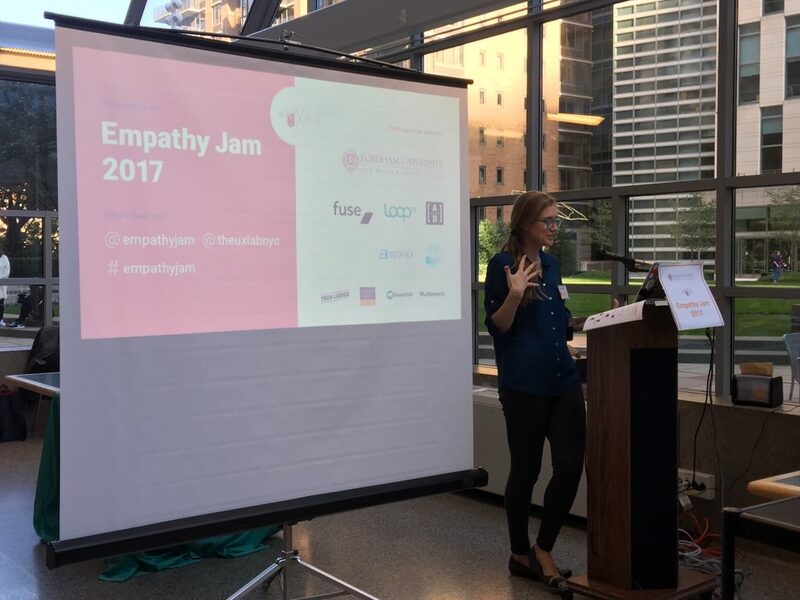 A few months after the inaugural Empathy Jam, Shannon (the creative visionary behind the event) reached out about being part of her committee to plan the next one. When someone as passionate and experienced as Shannon asks you to get involved in her project, it’s impossible to say no. – I love behind-the-scenes work. Dealing with the logistics of event planning is exciting for me. I enjoy project management and dealing with a lot of moving parts. Seeing things come together gives me a sense of joy. – I want to be part of the empathy conversation. I’m a humanities graduate who values empathy as a fundamental humanistic principle and strive to apply it to everything I do. I want to be deeply embedded in the conversation with the NYC design and tech community and how we exercise “empathy” in UX. We each have different things we’re passionate about. Bringing that together was hard. I am interested in everyday mobility and accessibility, while others are passionate about civic engagement and the emergence of artificial intelligence and machine learning. Finding common ground was important and we settled on collaboration. We also realized that other topics can be explored at future Empathy Jam events so it wasn’t absolutely important to cover everything. Affinity mapping our ideas at Brooklyn Roasting Company. When brainstorming the specific challenge statements, ideas came in abundance. That was not a problem. Having a lot of ideas on the table is always better than none. The difficult part was to tame our ideas. Gaining clarity, especially with four extremely opinionated and passionate people, was important. The challenge statements needed to be specific enough so that participants had some direction but also the flexibility and vagueness to interpret it however they wanted. A) How might we create ways to efficiently get New Yorkers from different perspectives aligned towards accomplishing a task or goal? B) How might we create tools and platforms that utilize AI for New Yorkers to learn and practice soft skills? Building our team of experts to bring in for the workshop, along with mentors and judges was exciting – probably my favorite part of this process. Figuring out the best people to bring into the event taught me a lot about outreach. I learned how to pitch my ideas well (something that I’m still working on) and ask for their buy-in. What surprised me was that folks in the design and tech industry are unbelievably kind. I admit, it was scary to do cold outreach to people I haven’t met. It’s especially a lot of pressure when reaching out to people who where introduced by an existing contact because I don’t want to let them down. Despite that pressure, everyone was extremely gracious during the process. Many people and companies declined due to conflicting scheduling or lack of interest. And that was okay. But no never felt like a hard “no.” If they couldn’t contribute this time around, they offered other resources that could be of use for us. UX designers aren’t just designers as their profession but truly amazing practitioners who came back to us with alternative solutions they could offer and I respected that the most. DAY OF – LET’S GET JAMMING! Our day started at 6:30 AM when we woke up and was actively on Slack making sure that the final preparations for the event were made. We started setting up early before our participants showed up and the excitement heightened. Once 9:00 AM rolled around, a lot of eager faces showed up at Fordham University. They were ready to work on the challenge we had planned for them. As they fueled up with some coffee and bagels, we got them checked in and ready to get jamming! Ariella kicked off the day with welcome words, especially bringing back the nostalgia toward our experience attending the first event. She did an exceptional job connecting with the audience and setting the tone for the day. Despite the fact that it was early on a Saturday morning, the energy in the room was wild. I also took over the Empathy Jam twitter account for the day and went all out! Ladies and gentlemen, the boss lady, Ariella Chivil. 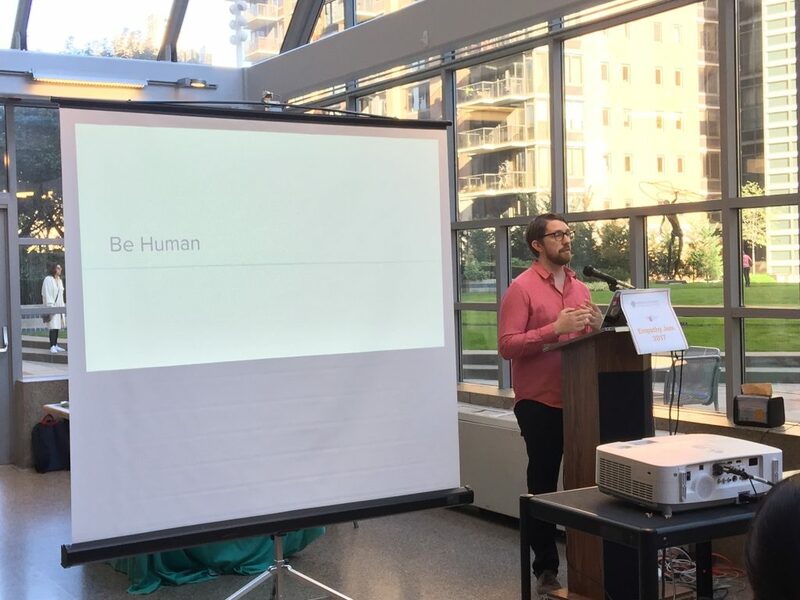 UX research comes down to this: Be Human. 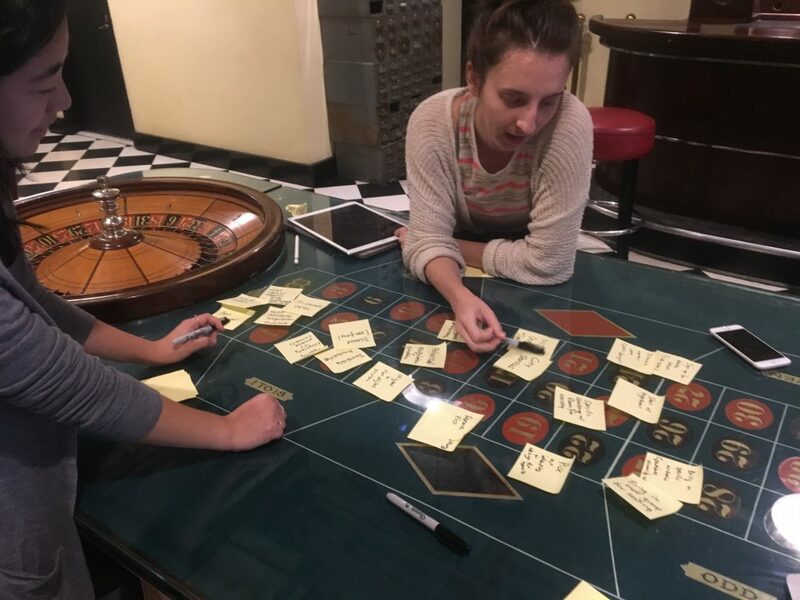 Now that we’ve equipped our participants with the secret weapon of UX research, it was time for them to break into groups and start working on a game plan for the day. They discussed who would do what and how to break up the tasks until it was time to present their solutions. At this point, our wonderful mentors were entering the doors and got involved in helping out the participants gain clarity with their approach to the challenge. After twenty minutes, we kicked them out of the building for them to do intercept interviews. Some were hesitant to leave the premises without a solid approach to the challenge but we reassured them that talking to people will help them figure out what direction they should go in. For many of them, it was their first time conducting interviews and they all returned with glowing faces. Hearing positive feedback about the research process was so rewarding. The reason why I fell in love with UX research and the Empathy Jam is because I feel a sense of profound joy when talking to users. Asking the right questions uncover important insights, which can lead to better questions. The feedback from interviews can really lead to some incredible solutions. The impact that UX research has on problem solving is undeniable. Throughout the day, our participants continued to work diligently with their teams. Whenever they faced a wall or had disagreements, they sought out the help of our mentors and asked questions to make sure they were on the right path. There was excellent use of supplies and the walls of the venue were covered in affinity mapping with post-it notes and creative prototypes. Many groups stepped out of the venue on several occasions to conduct more research and pursue usability testing. The final presentation portion of the event was the best part of the day – it was finally time for the participants to share what they worked on and pitching their ideas to our excellent panel of judges. We had a great group of judges there representing a variety of perspectives. Each of them shared where they come from, what they do and what they are most excited about seeing from the presentations. What impressed me the most was how everyone interpreted the challenge so differently and produced ideas that considered angles we didn’t even think could be covered. There were products using artificial intelligence to help the elderly, one to help people discover new career paths and a communication tool to be less demeaning. One that particularly stood out to me was Team 3 who created CleanRide as a solution to get people to collaboratively take care of their public transportation system. After all the groups finished presenting and the judges finished deliberating, it was time to award prizes to the best teams. Group 7, creators of Communication Pipeline, took home the prize for most civically engaged solution and won day passes for Civic Hall Labs. Neighbors by Team 1 got copies of “Practical Empathy” by Indi Young for best research. Team 9, City Connect, won most accessible solution and got beautiful tote bags and swag from Tech Ladies. Team 11 won most innovative solution for Mind Cues and got adorable Moment Design tote bags. Finally, Team 12 of What do you want to be when you grow up walked away with a generous Beginex UX scholarship for excellent storytelling. We wrapped up the day with some final words and a ton of thank yous. It was an exhausting day but one that was extremely rewarding. It was incredible to see all our hard work come together and even more amazing when our participants kept up their enthusiasm, despite challenges that they may have faced throughout the day. Following an event, it’s easy to lose the momentum and forget about the work done on the day of. Rather than to fall into that trap ourselves, we made it a point to follow up with everyone involved and keep the excitement high. In addition, we received back a lot of great feedback on the event. Everyone from the participants themselves to the mentors and judges gave their input on how we did and what areas could be improved. Many were impressed with the diversity of ideas produced by the teams. The passion and excitement in the room kept a lot of them inspired and energized throughout the day. 1. Treat venue hunting like apartment hunting. Don’t skimp on anything and make sure that the environment that our participants are in is priority. Unfortunately, the venue we used didn’t allow a lot of flexibility, especially with the food brought in but we learned that we need to plan way ahead in advance. 2. Be clearer about the challenge and focus on problem solving. I think that people (including me) get excited about emerging technologies and working on something that sounds cool in theory but the whole purpose of having design driven competitions is to fundamentally become better problem solvers. 3. Provide opportunities for networking with others. This was really tricky because of venue limitations. It would have been great if we had a space where participants could drink in the open while judges deliberated or some post-event networking portion. That’s definitely something to think about. 4. Start everything early. Planning and preparation takes a lot of time and starting earlier in the process could help us deal with hiccups more smoothly. I especially think starting earlier would allow us to secure more sponsors and think about the details that really matter. 5. Structure the right things. Some things were structured without reason, while others didn’t have enough structure. For example, we purposefully structured the schedule so participants are productive but that didn’t work quite as well as imagined. On the other hand, we should structure the judging criteria more so that it will be easier for them to come to a consensus quickly. Where do I even start? There are so many incredible people, companies and organizations to thank. I’m still over the moon about how we managed to assemble an incredible group of people and companies to support this event. This is exactly why I continue to be passionate about UX – the community of people who support one another is phenomenal. First, a huge thanks to Fordham University’s New Media and Digital Design department for hosting the event and supporting from behind the scenes. Thank you to our incredible sponsors: AB, Fuse Tools, Beginex and Echo Design. Thank you to these companies that provided our prizes: Rosenfeld Media, Civic Hall Labs, Moment Design, Beginex and Tech Ladies. We’re so thankful for your support! 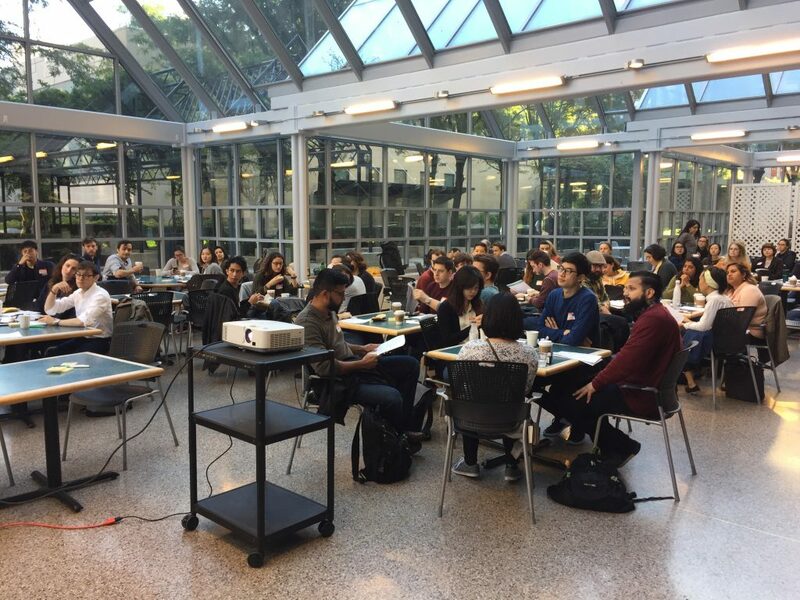 Thank you to our amazing mentors: Nathan, Allegra, Jessica, Lu, Michael, Amos and Elushika – you all were so phenomenal in keeping things together and encouraging our participants. Thank you to our amazing judges: Nicole, Terrell, Rob, Shannon and Ralph – each of your perspectives were really valuable and having you there was a privilege. Thank you to these powerhouse ladies, Shannon, Ariella and Krizia, my co-organizers and quite possibly the best team of collaborators. Finally, thank you. The event wouldn’t be anything if it wasn’t for the participants. We wanted the event to be centered around you and your amazing energy. It was especially a gratifying moment when many of you came back from your initial user interviews and your faces were lit up with enthusiasm (I might have already said that a million times). I love interviewing users and doing research. I find that process of talking to people and gathering feedback so enriching and seeing you feel that way made my heart melt. Thank you for being the best part of the day. This experience was exhilarating! It was incredible to be part of putting something together that the NYC tech community needs. During the event, there were many magical moments. I loved seeing participants reach out to mentors on their own and step outside their comfort zone to talk to users. I loved all the post-its around the room and the variety of prototypes represented. I’m inspired. I can’t wait to get back to work with the dream team and start planning the next one. If you haven’t already – join our Slack channel. Stay tuned! Why attend a UX hackathon?